Ellsworth, the prestigious late art dealer and collector of Asian art, devoted his life to loving, collecting and dealing Asian art. However, these art treasures will be dispersed into collectors across the world in the wake of his death in August at age 85, except those donated to museums like the British Museum and the Metropolitan Museum of Art. 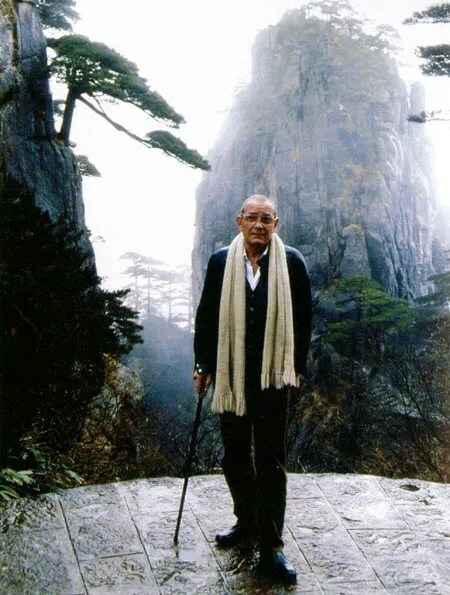 Ellsworth on Mount Huangshan in Anhui province during his trip to China in 1995. A major part of Ellsworth’s legacy is Chinese art, which he started collecting during childhood although he didn’t know a Chinese word. A room at Robert H.Ellsworth’s apartment on Fifth Avenue in New York. 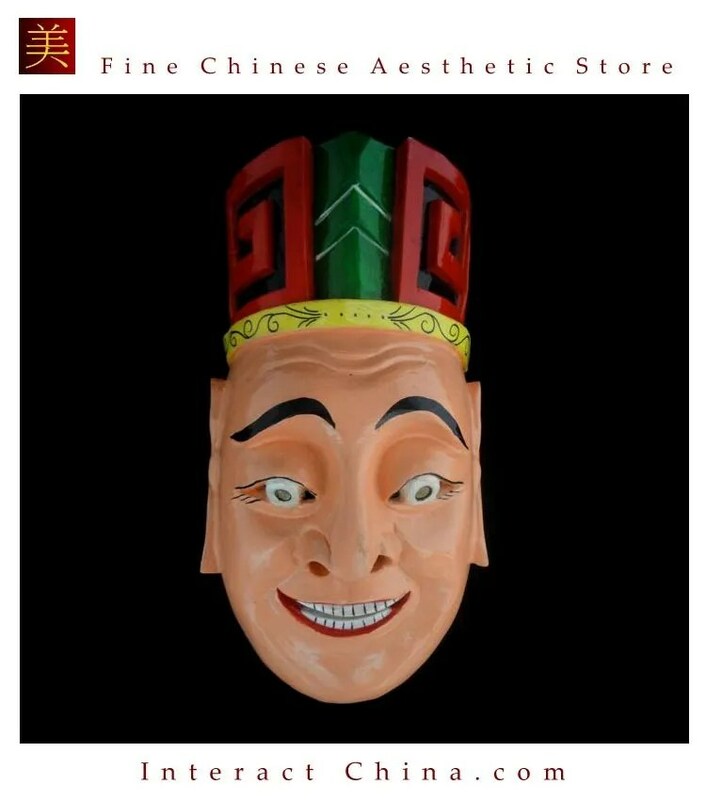 He was the first to bring Ming Dynasty furniture to the West in the 1950s. 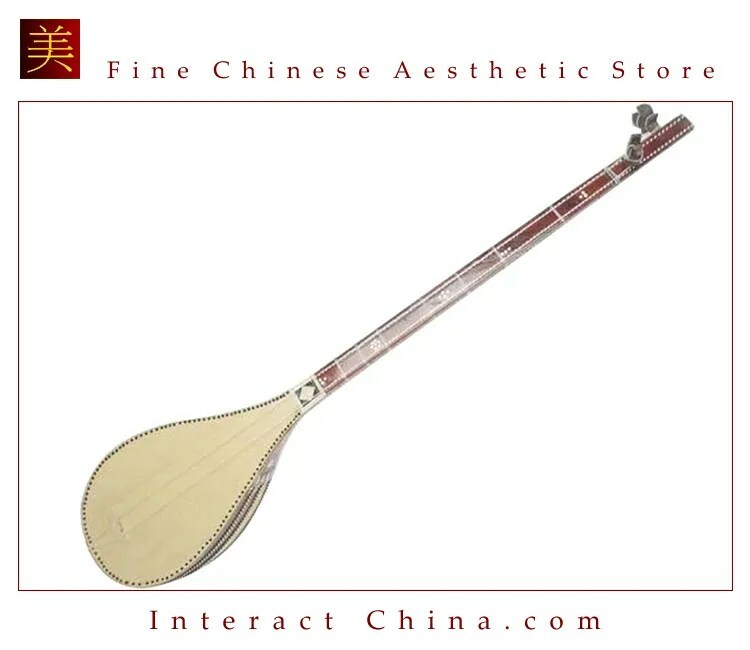 He made himself an expert on it and wrote a book, Chinese Furniture: Hardwood Examples of the Ming and early Ch’ing Dynasties, in the 1970s, even earlier than Chinese scholars’ books on the subject. 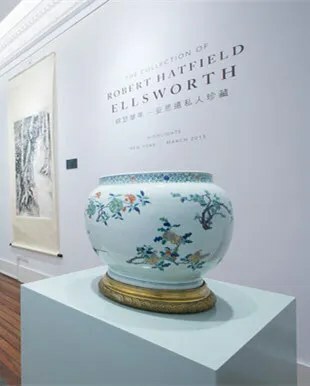 Because of his obsession with Chinese art and his unique taste, in the 1960s, Ellsworth began collecting Chinese paintings of the 19th and early 20th centuries, a period that has been neglected by art historians. Ellsworth’s collecting of Chinese art reached a climax when China and the US established diplomatic ties in the 1970s. In addition to his collection, Ellsworth also set up the Chinese Heritage Art Foundation in Hong Kong in the 1990s, dedicated to repairing the ancient houses of the Ming and Qing (1644-1911) dynasties in Huangshan in Anhui province. At that time, most Chinese didn’t realize the value of the structures in Huangshan’s ancient villages. 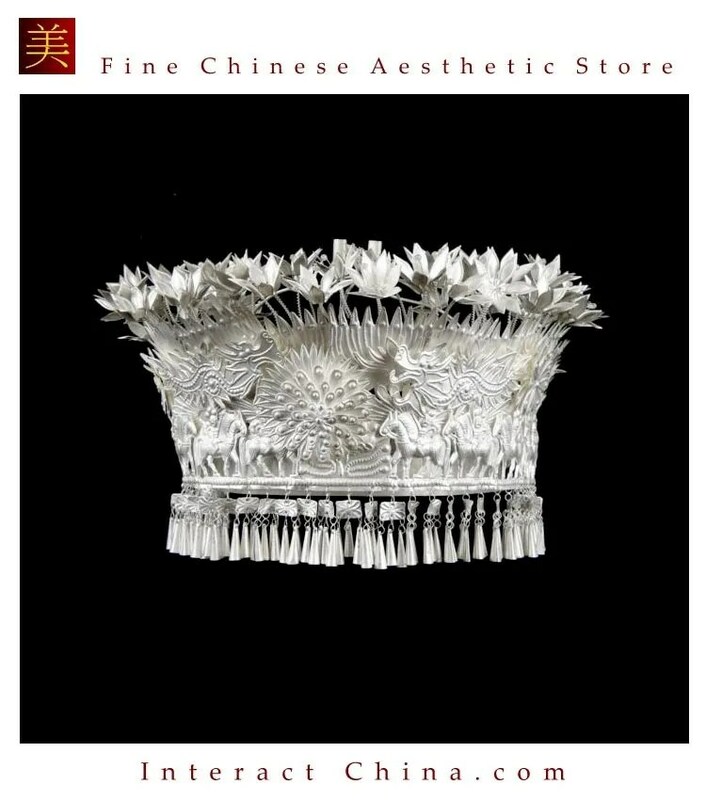 Two pieces of porcelain in his collection. For years, Ellsworth had bought and sold countless antique objects. But the ones he kept at his houses were those he wanted to live with. “If you don’t want to stay with your collections day and night, then don’t buy them,” he advised prospective collectors. 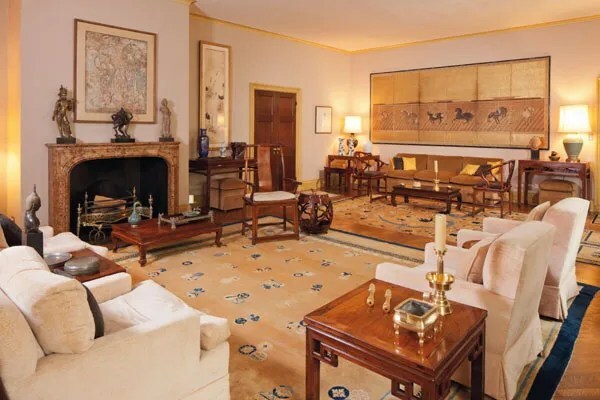 In the 20th century, many treasured Chinese antiques and artworks were lost during war times. Ellsworth was one of the first Western collectors to seek them out and became an expert and scholar on Chinese art. 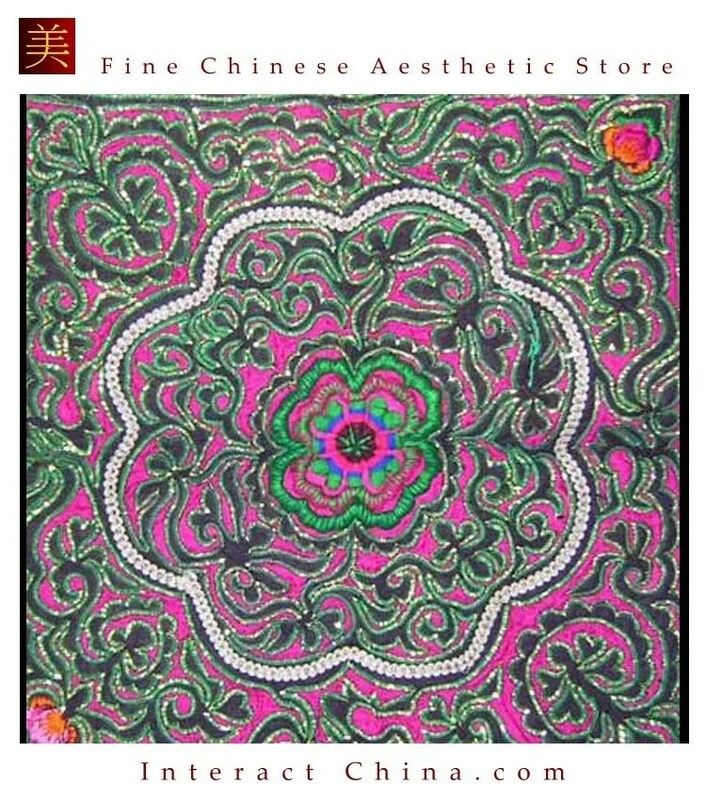 A mandala is a symbolic picture of the universe, used in Tibetan Buddhism and other faiths. The mandala’s purpose is to help transform ordinary minds into enlightened ones and to assist with healing. Sand mandalas are particularly used in Tibetan Buddhism. According to Buddhist scripture, mandalas constructed from sand transmit positive energies to the environment and to the people who view them. They are believed to effect purification and healing. There are many different designs of mandala, each with different lessons to teach. The mandala represents an imaginary palace that is contemplated during meditation. Each object in the palace has significance, representing an aspect of wisdom or reminding the meditator of a guiding principle. 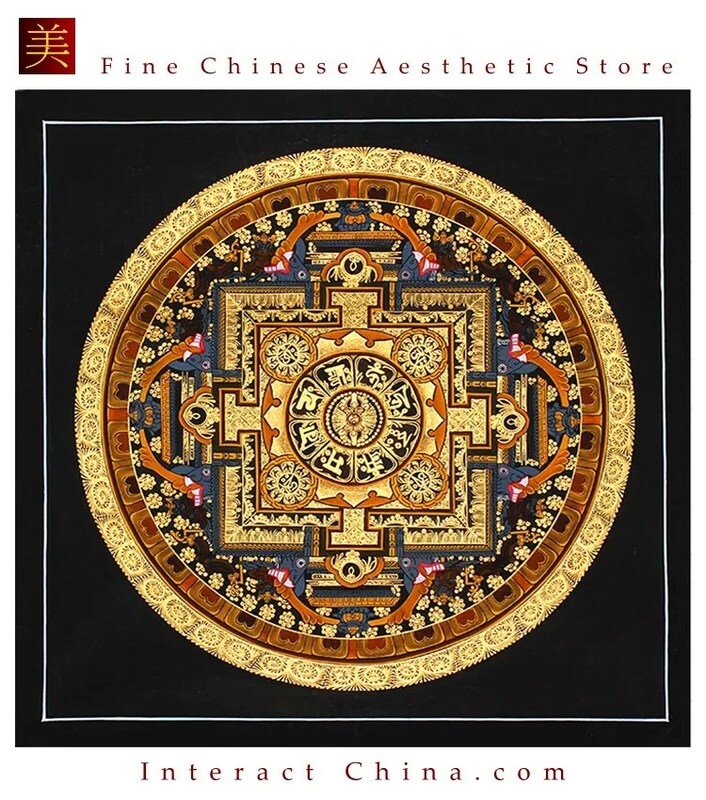 The Tibetan mandala contains deities, with the principal deity in the centre of the pattern. 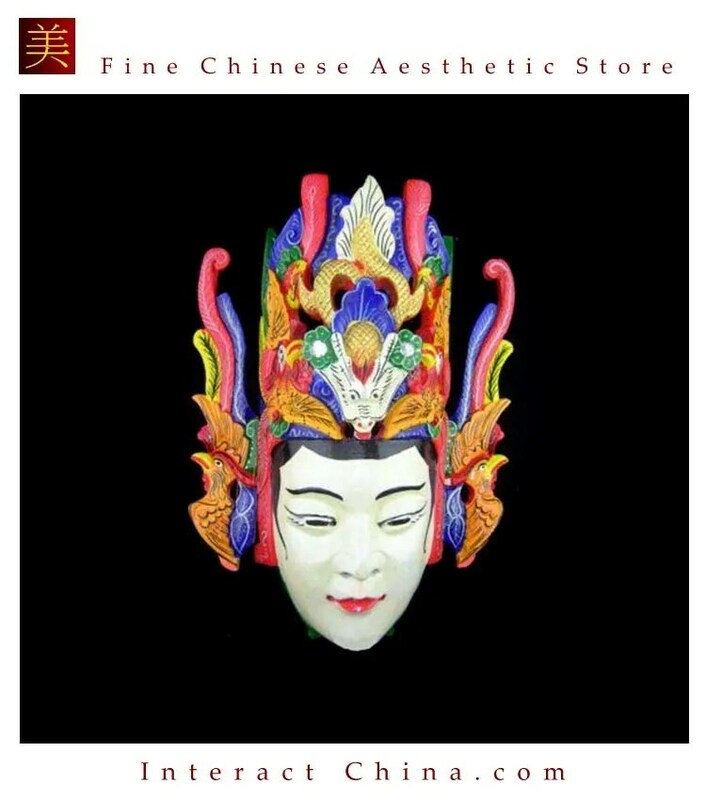 The deities who reside in the palace embody philosophical views and serve as role models. 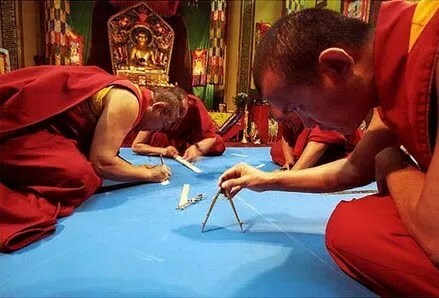 It usually takes Tibetan Monks several days to design and place tiny grains of sand to create a beautiful work of temporary art, then it will be destroyed immediately once it is finished. 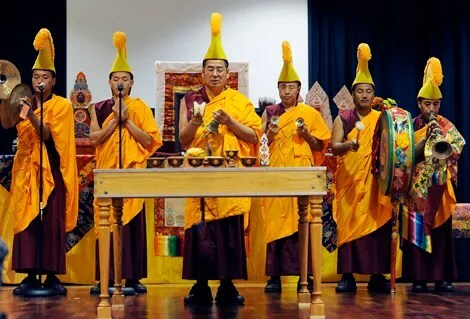 The mandala sand painting process begins with an opening ceremony, during which the lamas consecrate the site and call forth the forces of goodness. 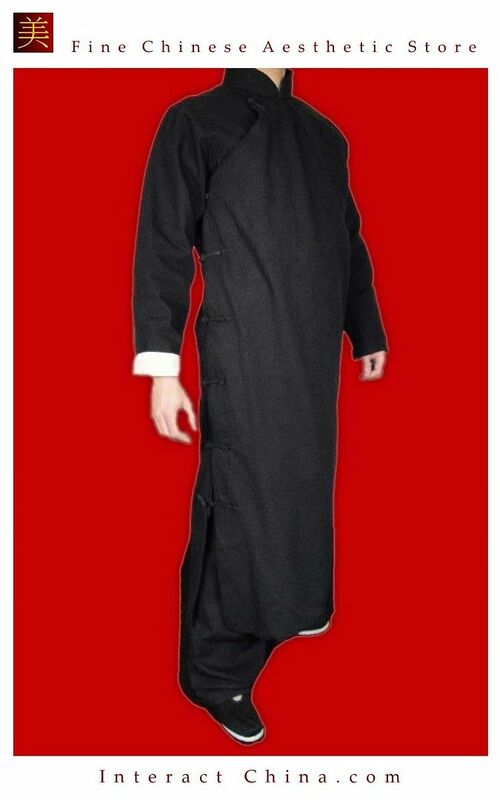 The monks chant and dance in resplendent dress. This event is visually and acoustically striking. After the Opening Ceremony the monks start drawing the line design for the mandala. The design of the mandala is marked with chalk on a wooden platform. This is very meticulous work that takes about several hours to complete. Then the monks use metal funnels called chak-pur to place millions of grains of dyed sand to make the elaborate patterns. The vibrations of the serrated chak-pur being grated with a metal rod cause the sand to flow like liquid. The mandala is constructed from the centre outwards. This mandala took several days to complete. The monks conclude their creation of the mandala with its consecration. In some cities, several thousand guests have attended the closing ceremony. Once the mandala is complete, it is ritually destroyed. During the Closing Ceremony, the monks dismantle the mandala, sweeping up the colored sands to symbolize the impermanence of all that exists. Half of the sand may be distributed to the audience in small bags as blessings for personal health and healing. 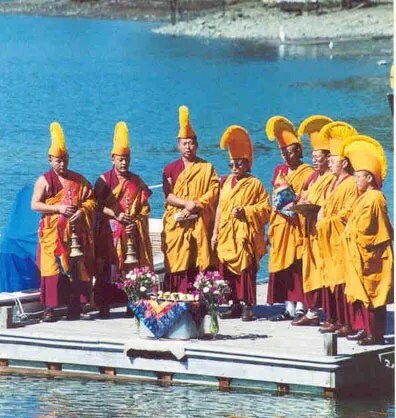 The monks, along with spectators, travel to a body of water. The sand is then ceremonially poured into the water in order to spread the healing energies of the mandala throughout the world. 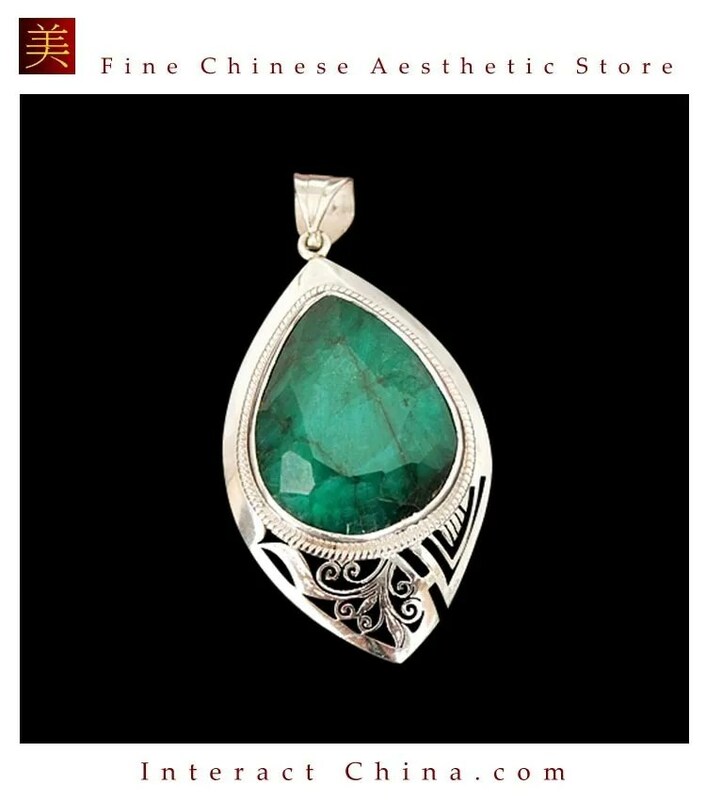 It is seen as a gift to the mother earth to re-energise the environment and universe. 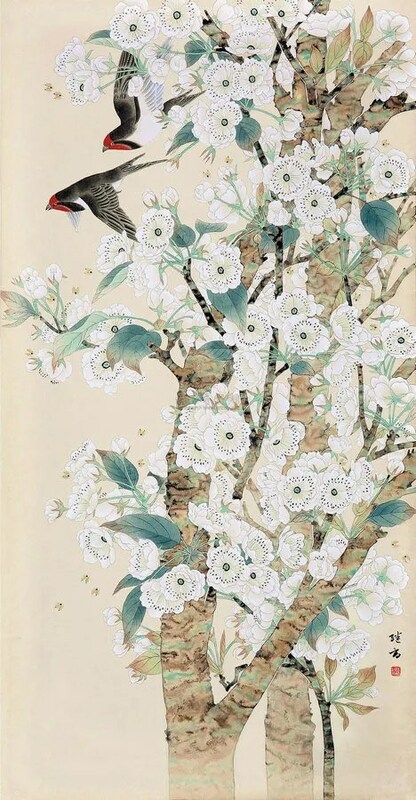 Flowers and birds were favorite subjects of paintings in ancient China, offering a kind of special aesthetic interest. Flower-and-bird painting originated from the Tang Dynasty (618-907). 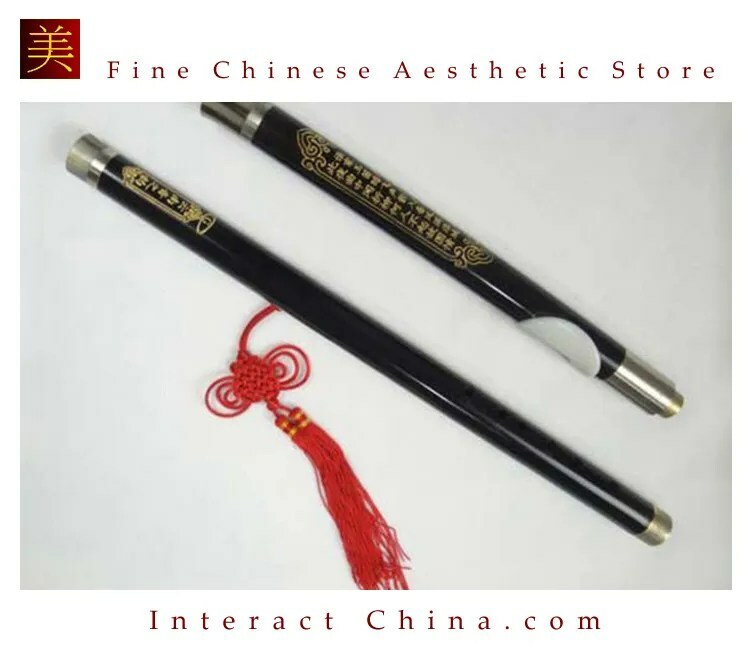 This art form slowly advanced from initially serving as an ornamental pattern for daily utensils, then later serving as symbolic, metaphoric and allegorical elements in the background of figure painting. Finally, flowers and birds are seen in independent themes. 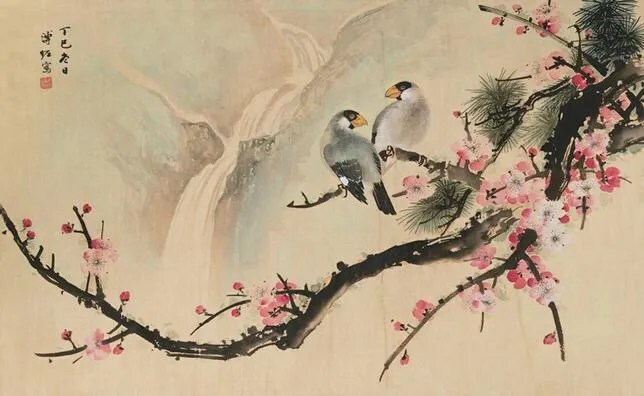 Flower-and-bird painting further developed during the Five Dynasties period (907-960), and reached maturity during the Song Dynasty (960-1279). 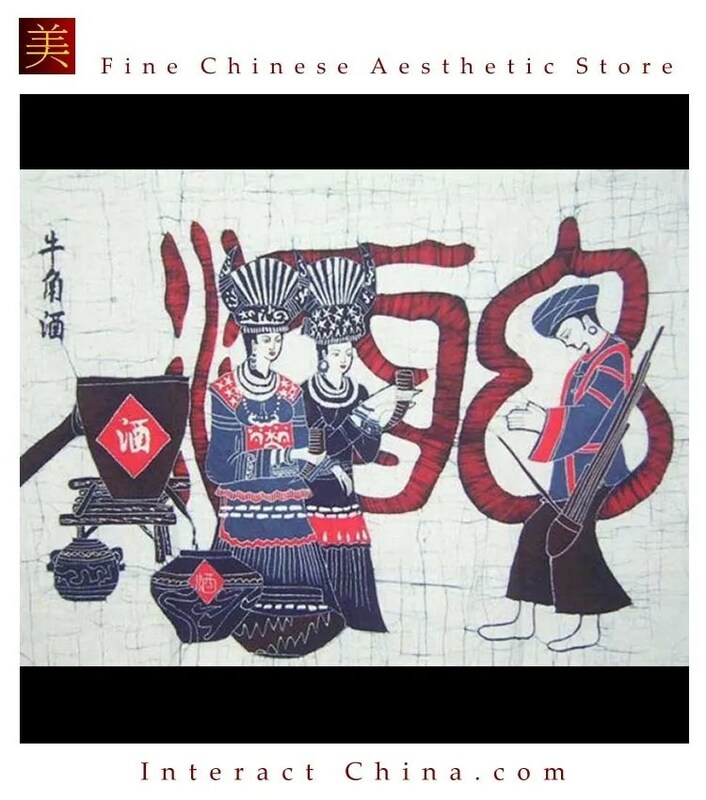 The Five Dynasty Period was a crucial era of shaping this style as one of the three major trends in Chinese traditional painting, together with Landscape Painting and Figure Painting. 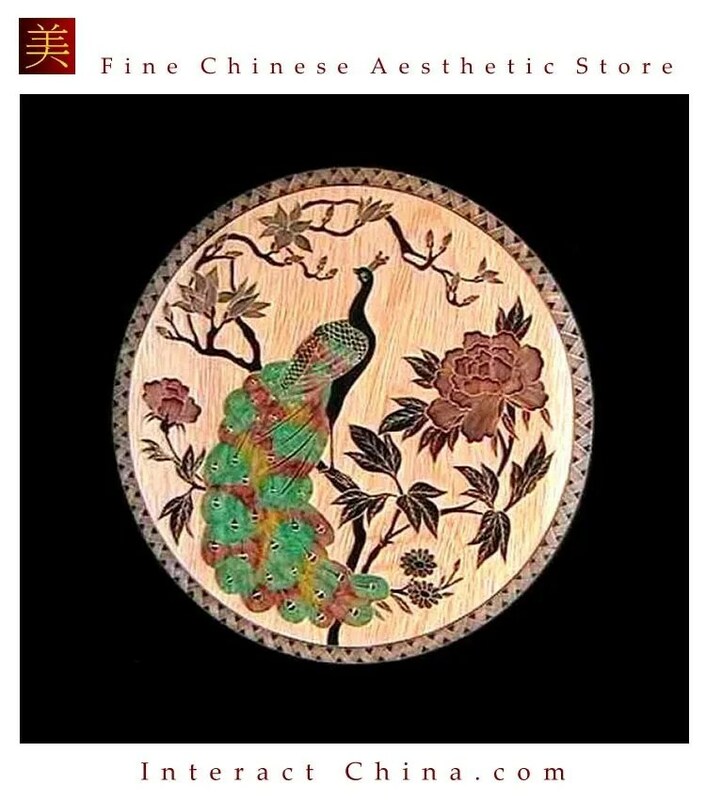 Flower-and-bird painting is peculiar to China. Flowers and birds can be associated with almost all thoughts and feelings of a human being. 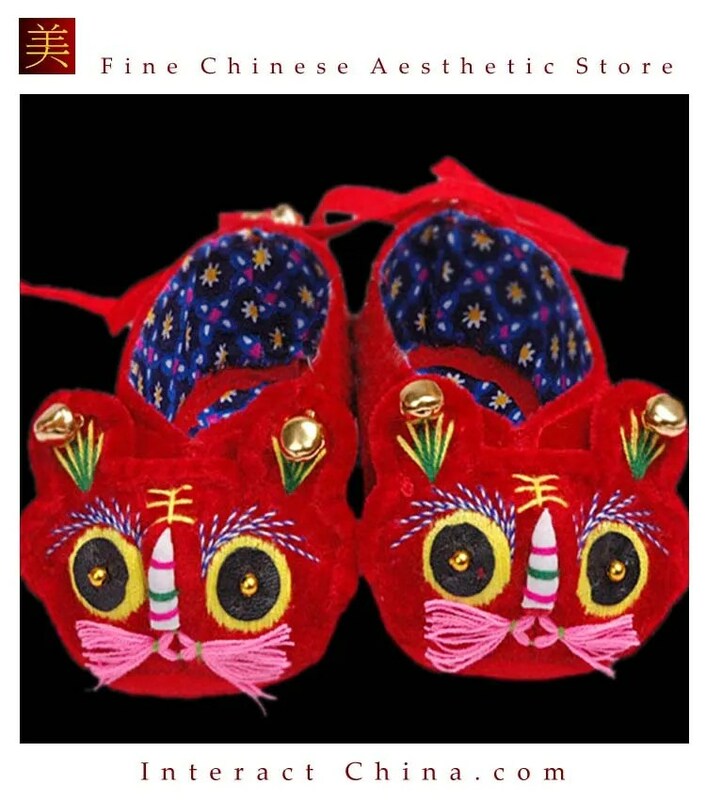 They can symbolize feminine beauty, virtue, political authority, omens, and lucky niceness. 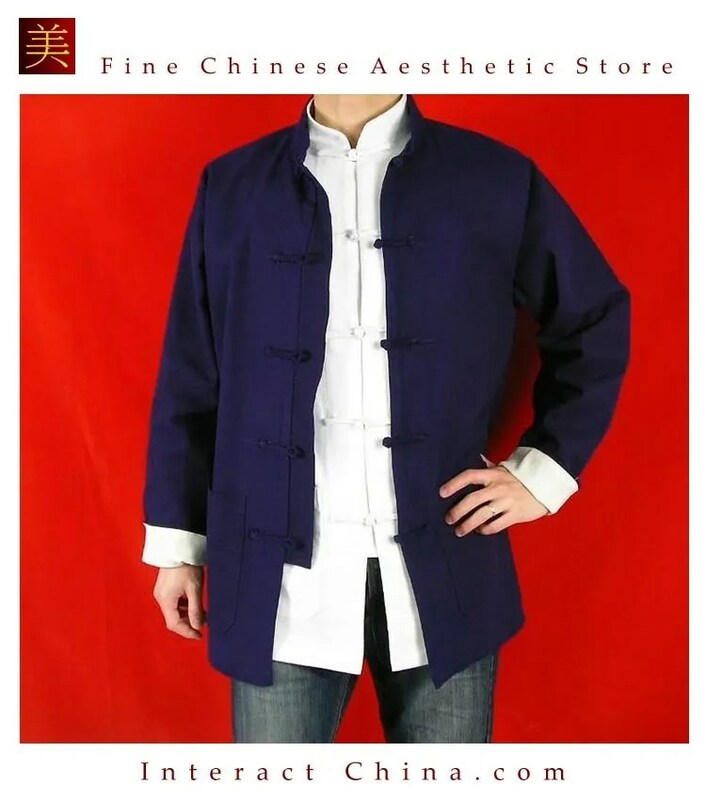 Once established, this tradition became popular in every dynasty. Therefore, their symbolic meaning grew increasingly rich and specific. Four Gentlemen and Three Friends of Winter are the representatives of flower-and-bird painting. 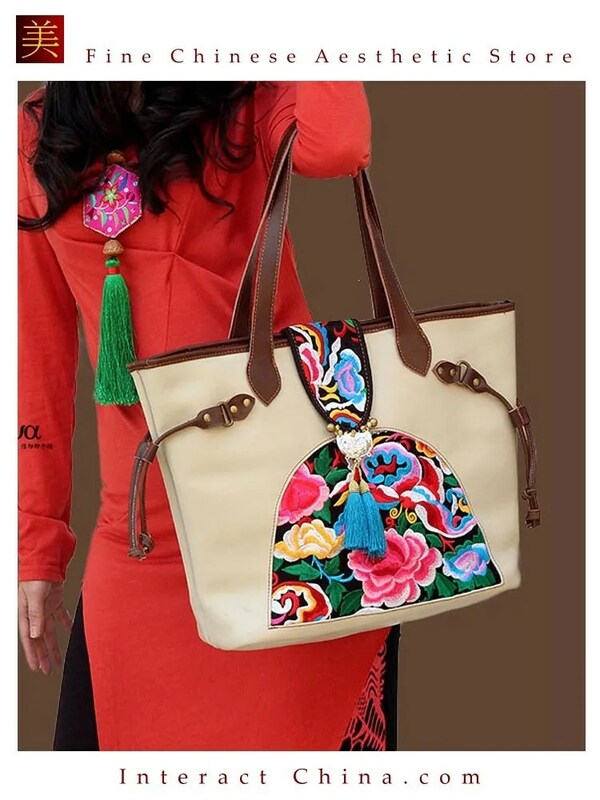 Plum blossom, orchid, bamboo, and chrysanthemum were known as the Four Gentlemen. Their common features are nobleness, modesty, and integrity. 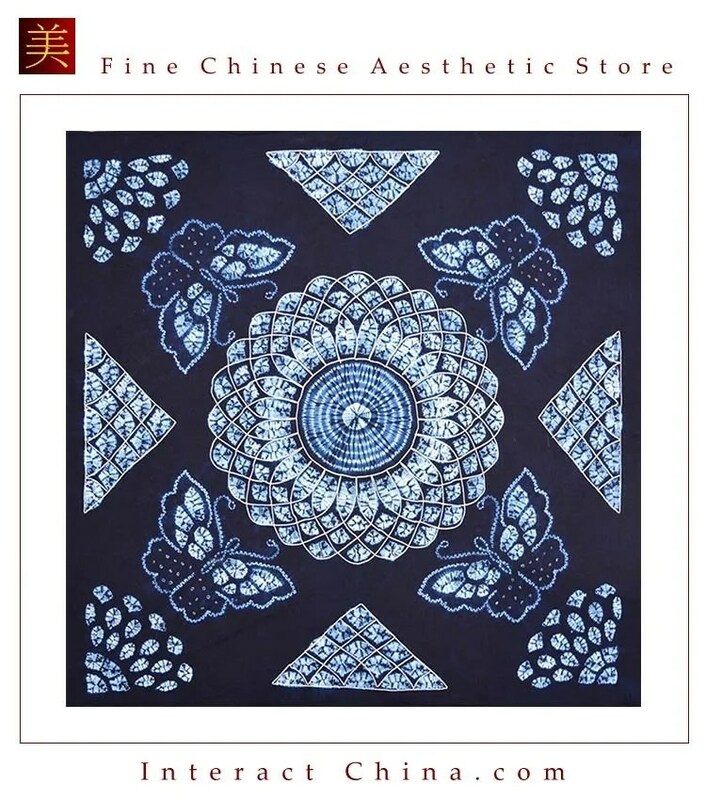 And as the Three Friends of Winter, pine, bamboo, and plum blossom are often associated with a man of great virtue. For their own natural qualities, these five plants are given the corresponding symbolic meanings and appear in flower-and-bird paintings frequently. 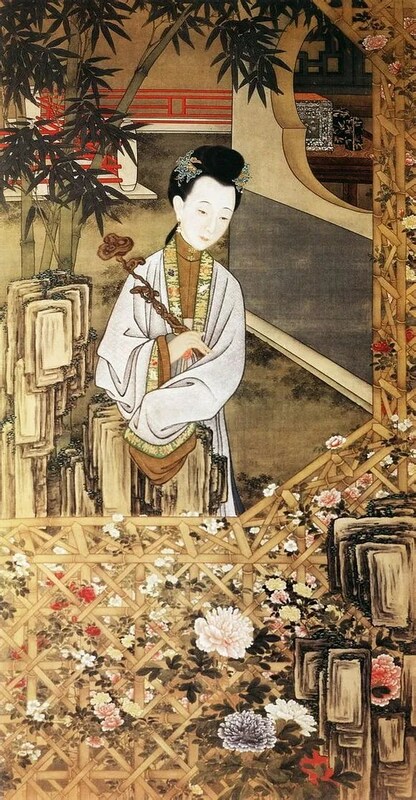 The tradition of flower-and-bird painting evolved into two main trends, namely the Gong Bi tradition where artists focused on small details, careful application of color and meticulous technique, giving their art a realistic and ornamental feeling, while the other trend of Xie Yi is more expressionistic and impulsive. Chinese painters love nothing more than spring flowers when they depict spring scenes. Those early bloomers bring the first burst of color onto the drawing boards of a new year. 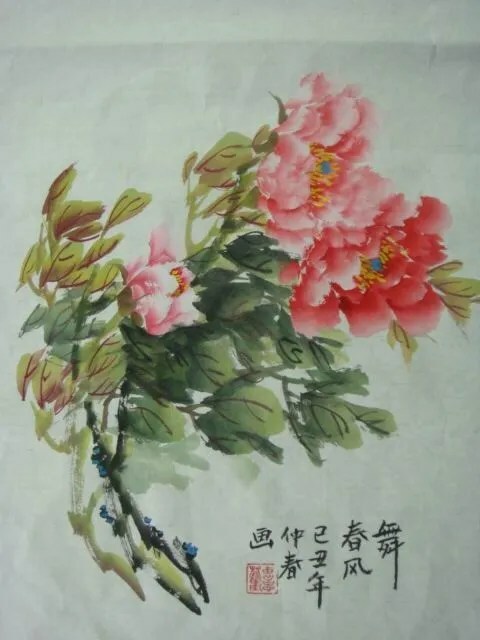 Here is a list of spring flowers in Chinese paintings. You may find some fabulous scenes of spring, and you can just enjoy the pleasant season without going outdoors. 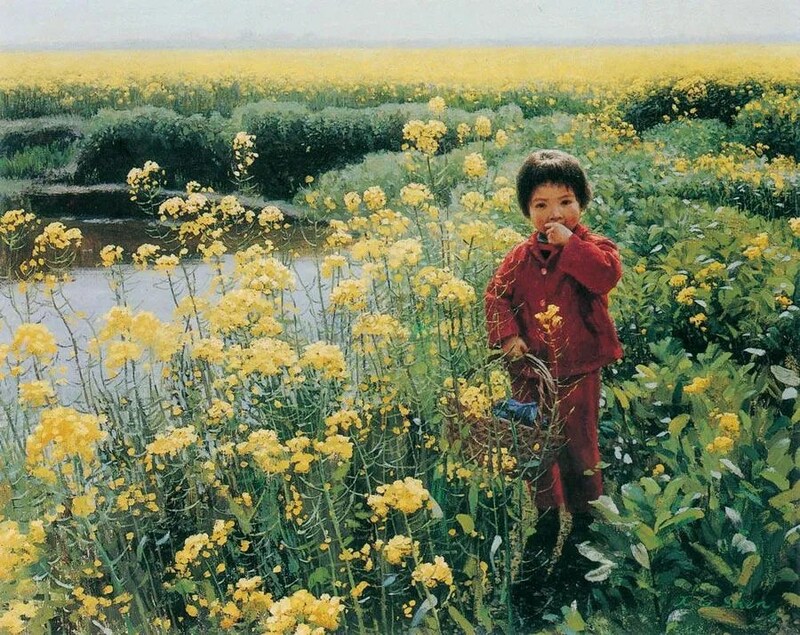 A painting of canola flowers by Shen Xinggong. Canola plants not only provide us with the world’s major source of vegetable oil, but also stunning spring scenes, when fields of canola flowers transfer the landscape into a huge golden blanket. 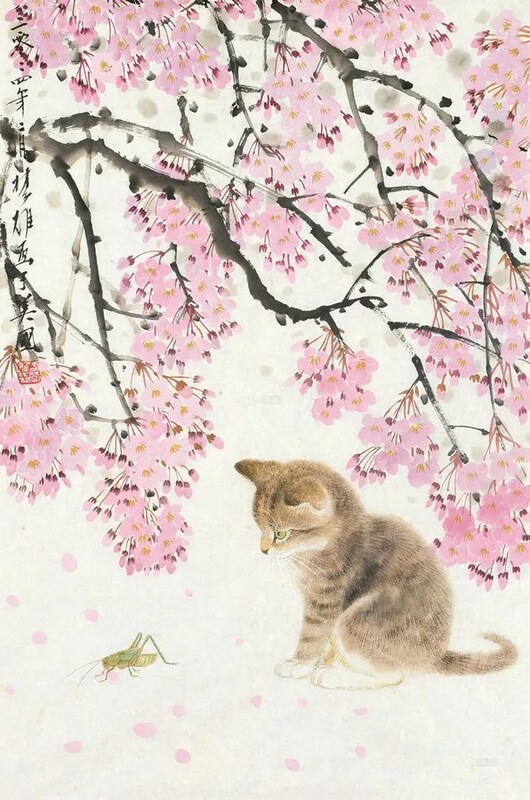 A painting of peach blossoms by Zhou Chunya. 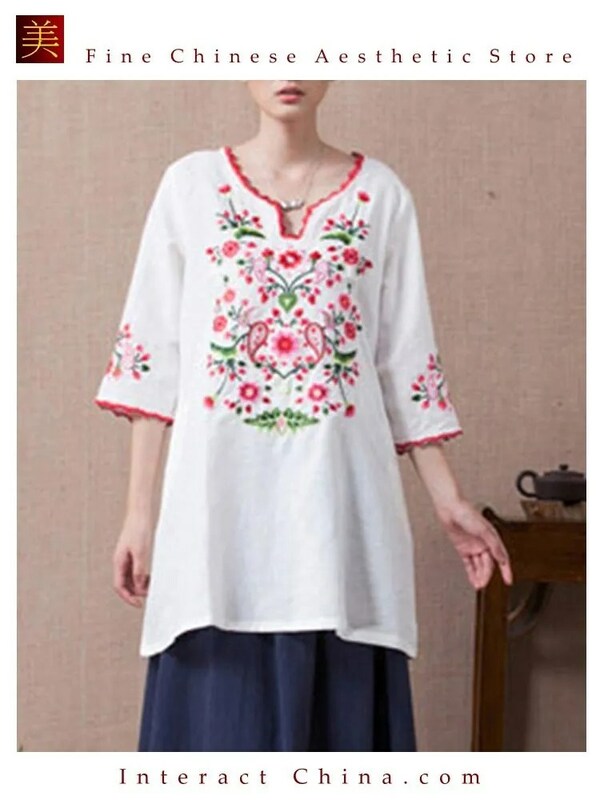 Peach blossoms are highly appreciated in Chinese culture. It is believed that the peach possesses more vitality than any other tree because its blossoms appear before leaves sprout. 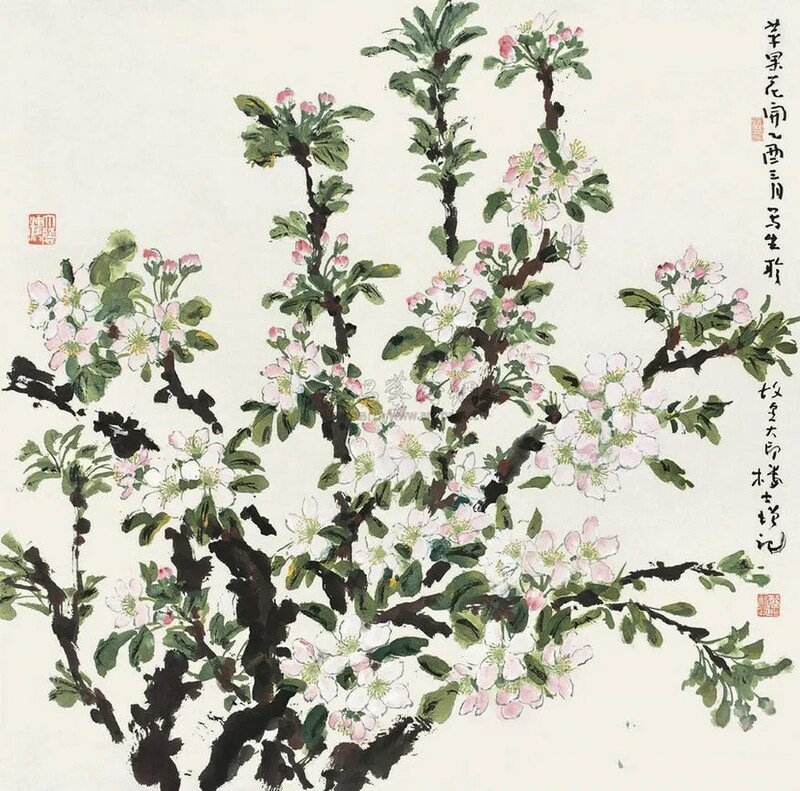 A painting of pear blossoms by Yu Jigao. Beautiful things are often fleeting. Pear blossoms always seem to bloom in profusion overnight and are soon washed away by the rain before people realize they are there. 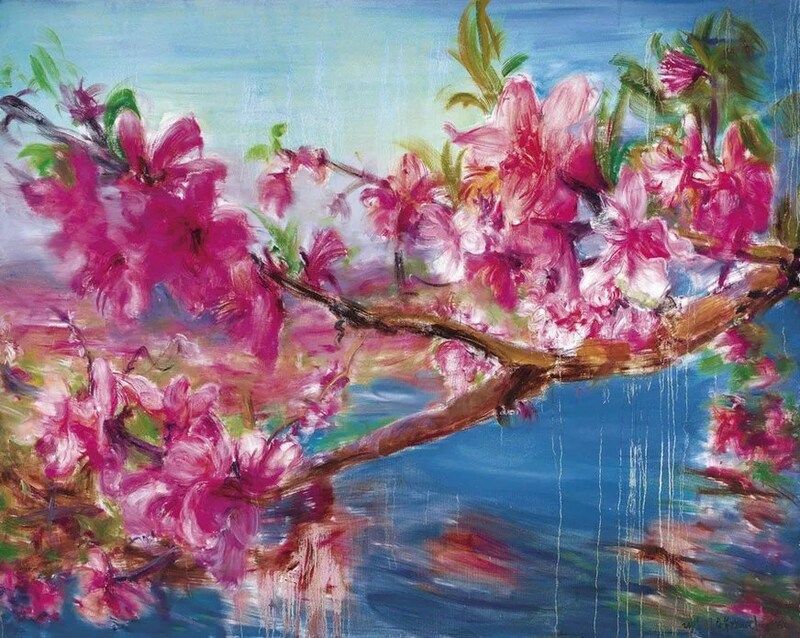 A painting of cherry blossoms by Fang Chuxiong. Although the cherry blossom is part of the Japanese culture, the delicate pink flowers are enjoyed in most cities around the world. 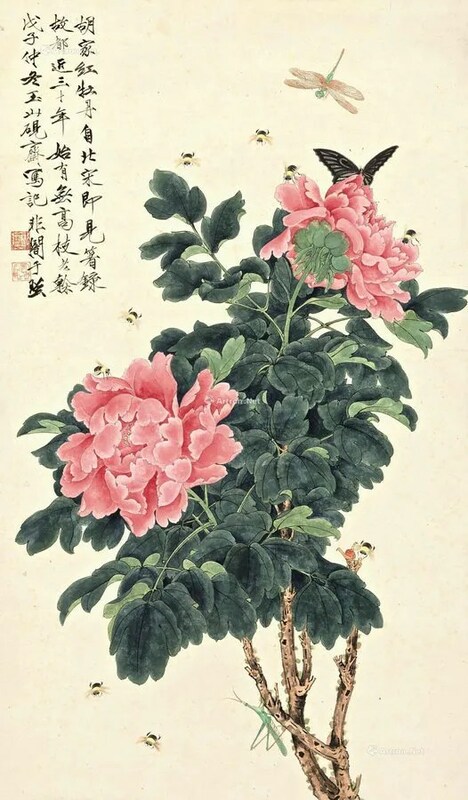 A painting of peony by Yu Feian. Peony is the traditional flower symbol of China, and was formerly grown only for the Chinese emperor. The massive blooms are often associated with fortune, prosperity, and nobility. 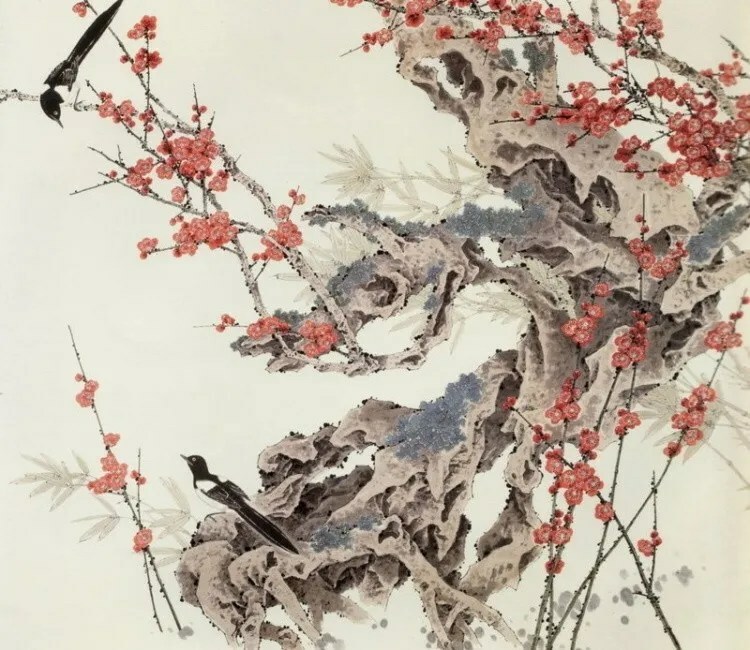 A painting of crabapple blossoms by Zhang Shizeng. 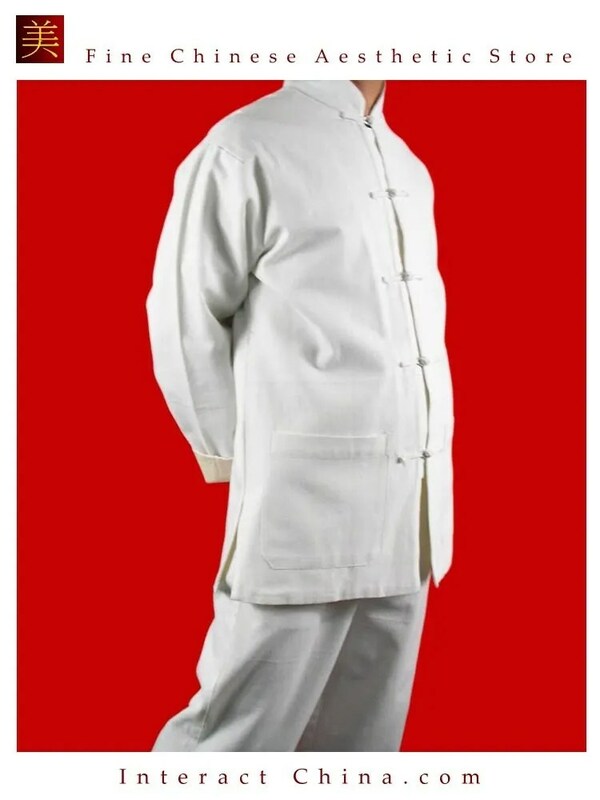 The famous traditional Chinese medicine doctor of the Tang Dynasty (AD 618-907), Sun Simiao, considered the blossom as an herbal medicine to resist some heart diseases. 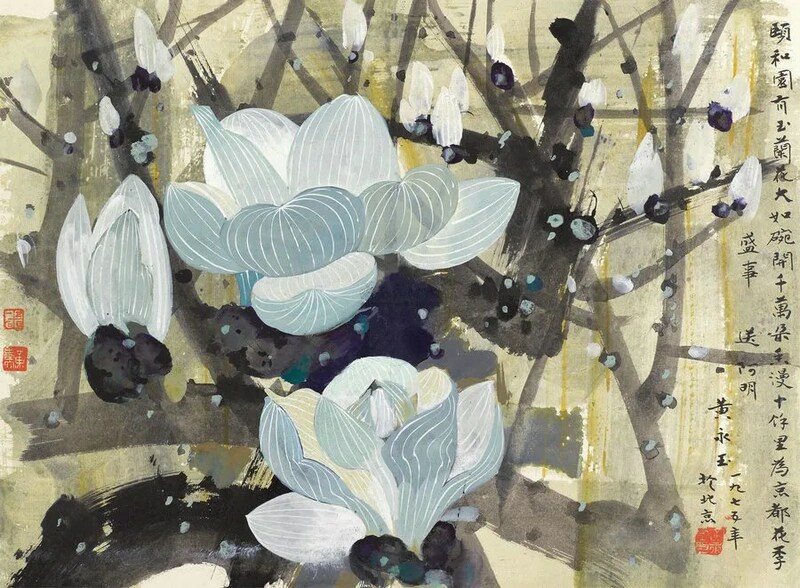 A painting of magnolias by Huang Yongyu. Long-lived magnolia trees were loved by ancient Chinese royal families, and often planted in the temple. 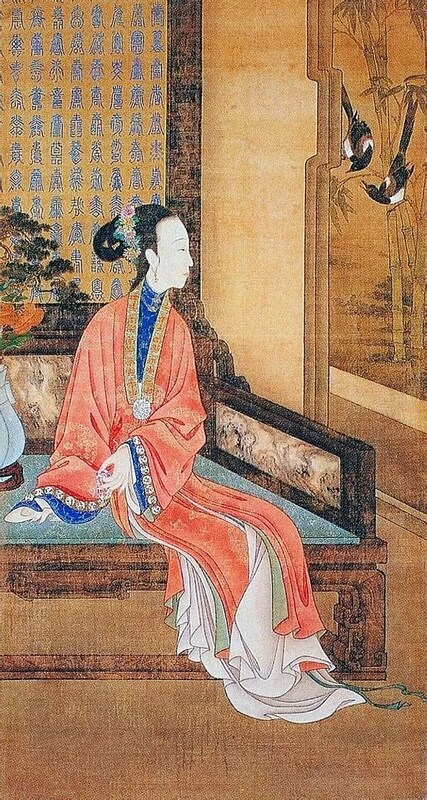 Sitting on the mottled bamboo chair, this lady glances down, absorbed by her private thoughts. 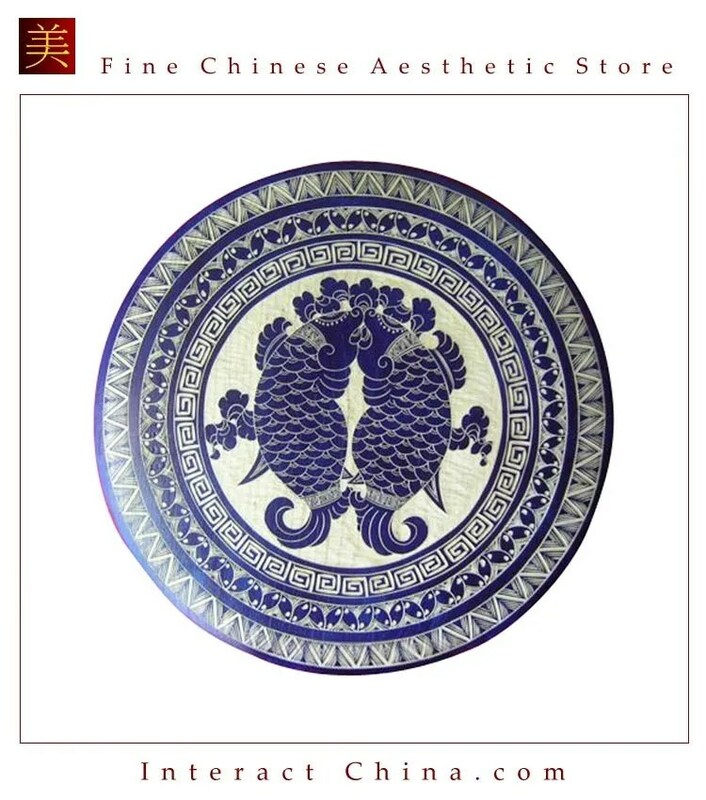 She is surrounded by an array of treasures displayed on shelves including fine ceramics. 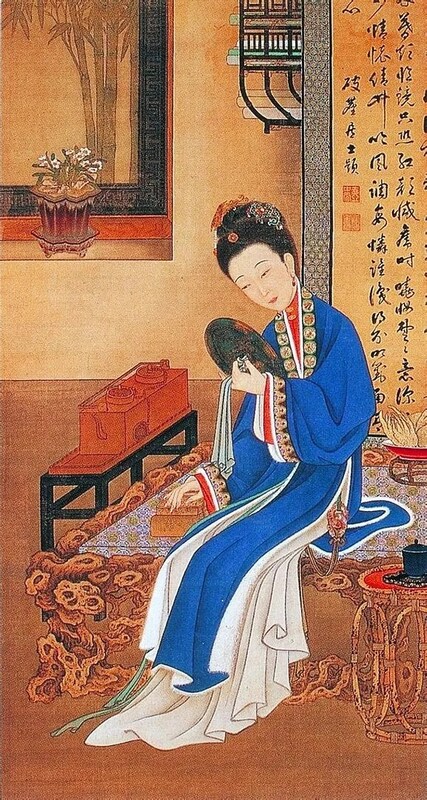 For example, behind her is a Ru ware style brush washer, and a jade table screen; to her left (our right) is a red-glazed monks-cap ewer, and a bronze zun wine beaker. 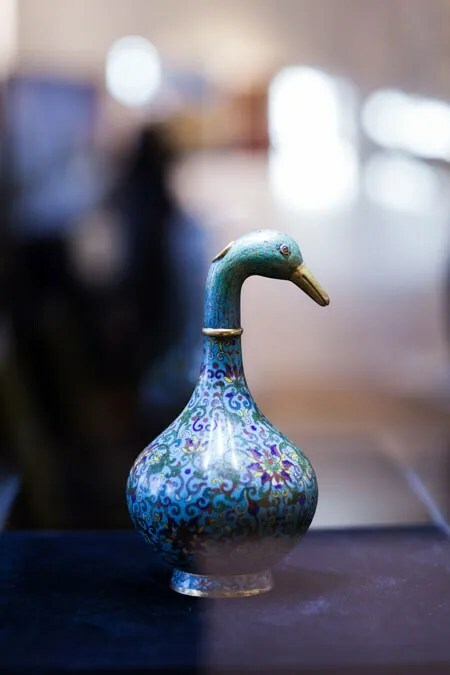 All identifiable as objects from the Kangxi and Yongzheng periods, these objects present the quintessential opulent style of the imperial household. 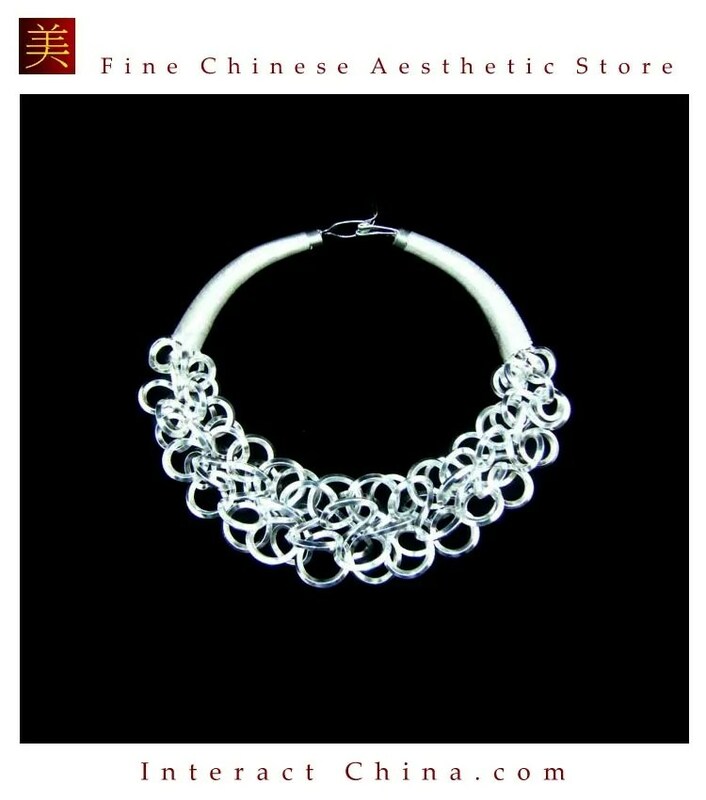 These treasures not only add credibility to the authenticity of the scene, they also are used to convey the woman’s interest in antiquities. Seated indoors on a couch and playing with a jade interlink, this lady is lost in thought while watching the pair of magpies that are calling outside. 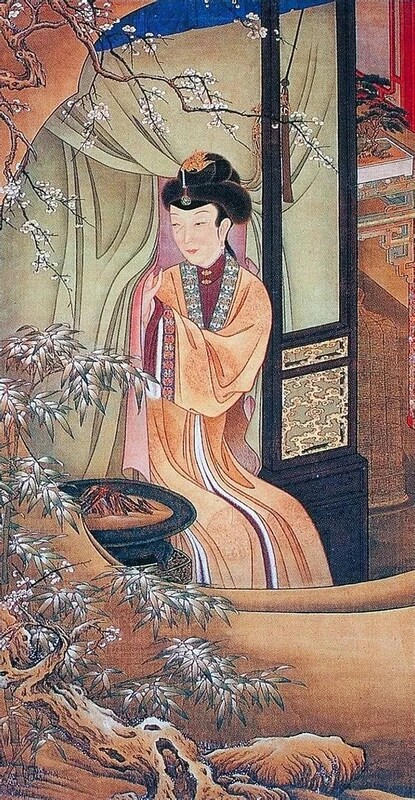 The artist means to show the woman’s happiness at the end of winter and the beginning of spring, but he also, perhaps inadvertently, conveys a sense of stifling solitude and utter loneliness that was the lot of many women in the palace. The screen behind her is inscribed with hundreds of different forms of the character for longevity. Although the message is to extend life hundreds of years, one feels she would willing trade the life of an immortal for the devoted pairing of Mandarin ducks. Sitting next to a table in a study, this woman holds a fine enamel watch. On the table stands a vase with chrysanthemums, which indicates that the time is the eighth lunar month (early autumn). Elegant and lofty, the chrysanthemum is much appreciated in the autumn for its ability to resist the cold. 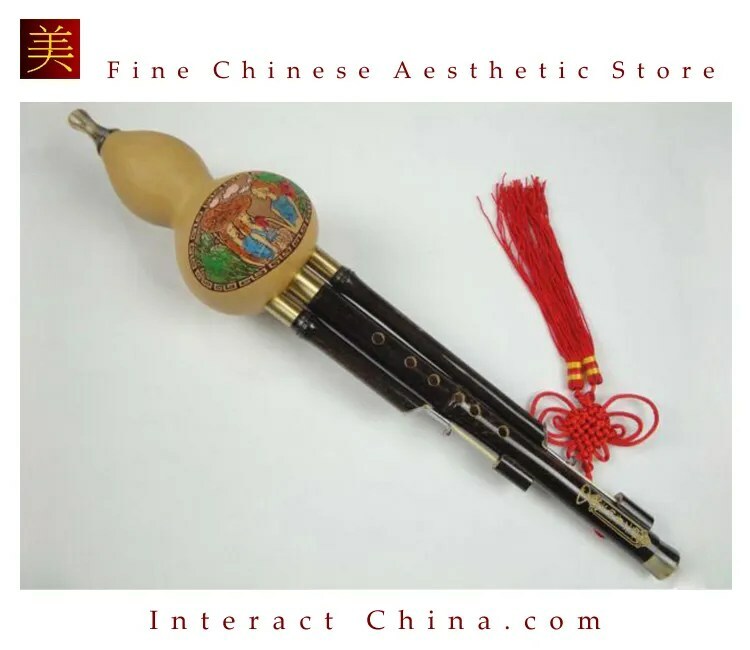 Endowed with a hearty nature, it was associated with firm resolution and longevity, and was also appreciated for its simple beauty and refinement. It became the favored ornament to adorn both hair and rooms in the house. 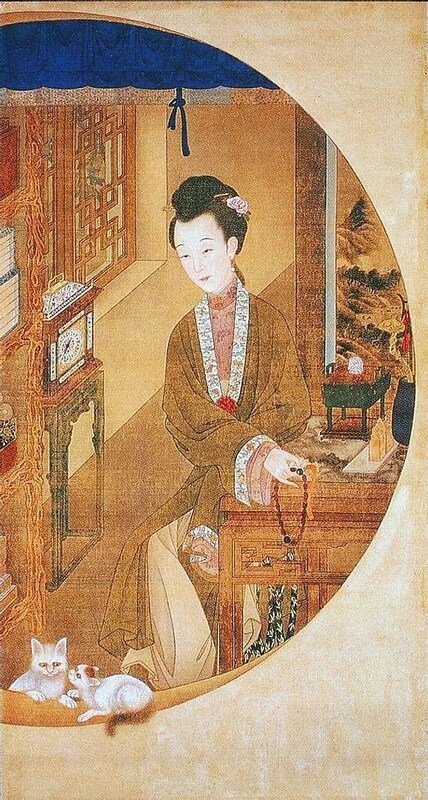 Behind her is hanging a scroll with a poem by the great Ming dynasty calligrapher Dong Qichang (1555-1636). The European astrolabe on the small table in the next room and the enamel watch that the woman holds in her hand are indications that Western objects were already becoming fashionable in the palace. 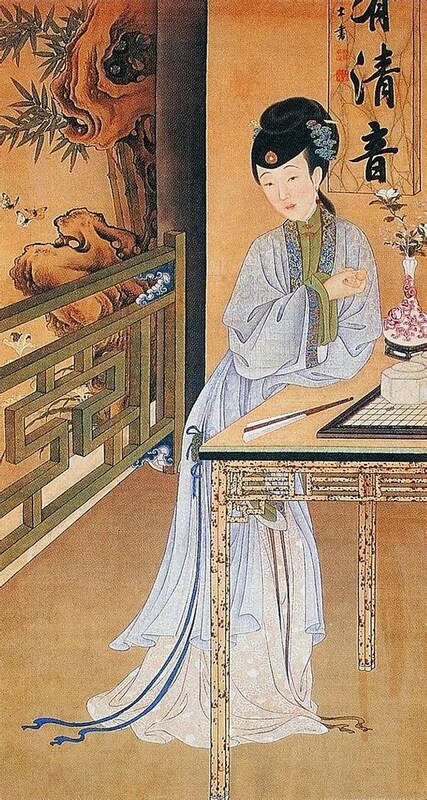 Sitting upright, slightly leaning on the table, and leisurely handling the prayer beads, this lady is watching two cats play on a windowsill. The painter has us view the interior of the room from outside the round window, so the focal interest in this painting is relatively small, but because the painter used western one-point perspective, the foreground, middle ground, and background are laid out systematically, which has the result of significantly expanding the sense of space and also extending the charm of the scene. The chime clock next to the lattice window is marking the passage of time as the cats play on the threshold of inner and outer space. In an ambiance of suspended activity, the days thus pass quietly. 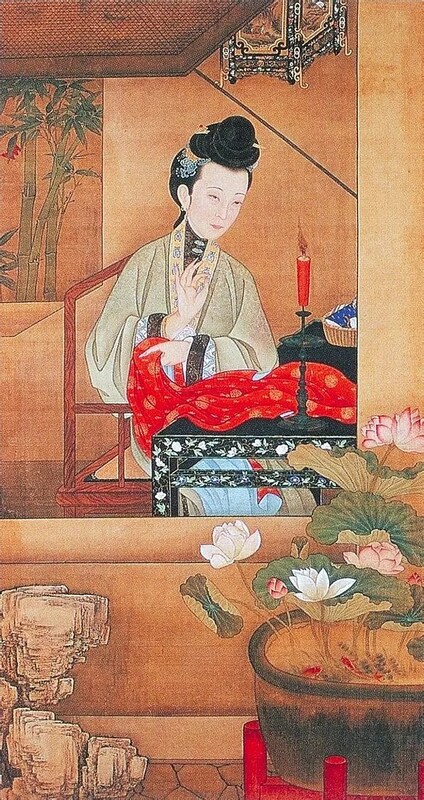 Wearing a fur-lined surcoat, and with jade adorning her wrist, the lady in this painting holds a bronze mirror in one hand, while warming the other by gently resting it on a brazier. In the background, there is a hanging scroll inscribed by Hermit Pochen. Pochen (literally “defeating the dust of the world”) was the sobriquet that the Yongzheng emperor had adopted when he was still a prince. It implies that he aimed to be pure of heart and had few desires. 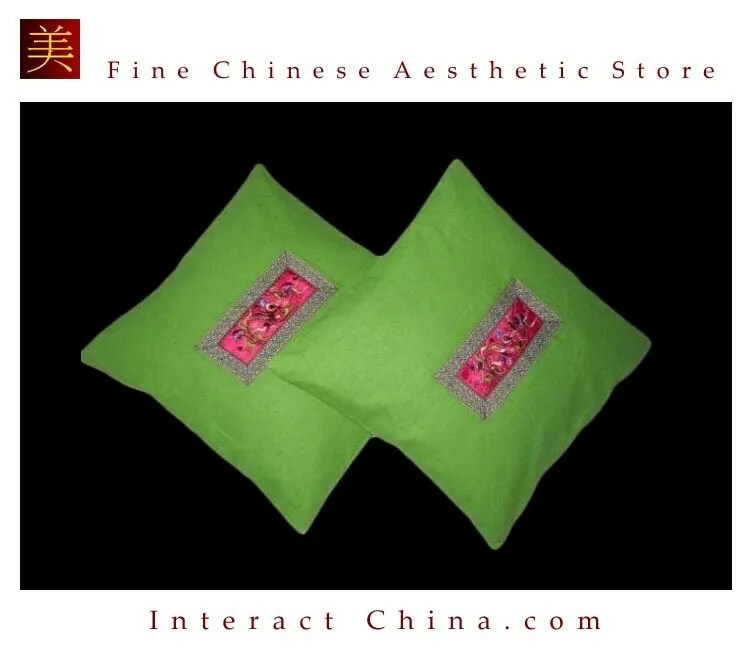 Gently holding back a curtain, a lady sits on a bed beside the window and admires the snowy scene and blossoming plum tree. Covered with frost and snow, the jade-green bamboo looks strong and fresh despite the cold. Celebrated in poetry for its life force (it blossoms in late winter before the snow has melted), the white winter sweet is favored not only for its beauty but also because the five petals of its blossom are associated with five blessings including happiness, good fortune, health, auspiciousness, and longevity. When Yongzheng was still a prince, he commissioned this beautiful set of paintings for the purpose of decorating a screen in the Deep Willows Reading Hall, a study within his private quarters at the Summer Palace. An imperial garden to the northwest of Beijing, the Summer Palace was presented to the young prince in 1709 by his father the Kangxi emperor (r. 1662-1722). 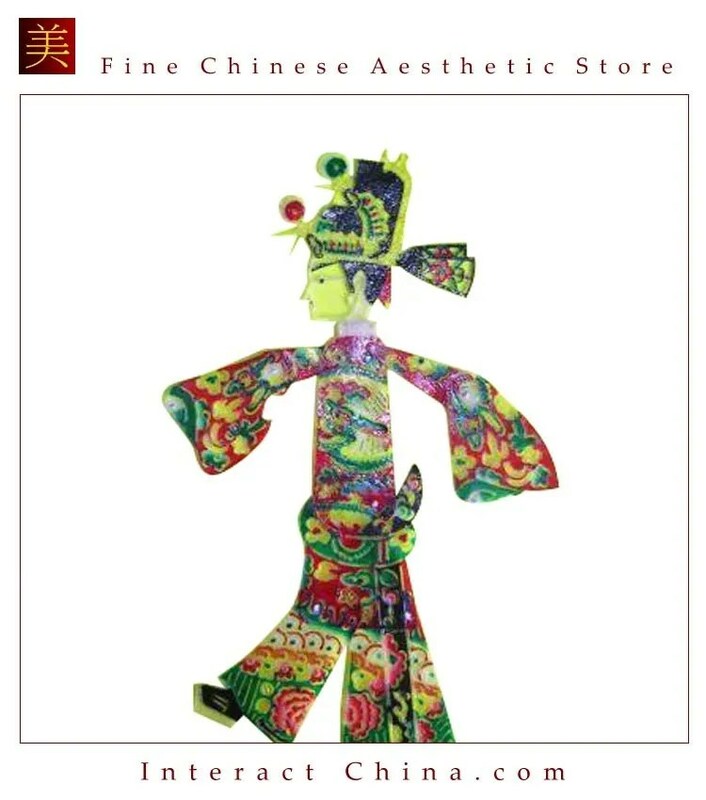 Painted in realistic style with neat outlines and generous color, the set follows the custom of depicting ladies of the court as women of elegance and natural grace. The artist portrayed these imagined beauties at leisure activities such as sampling tea, watching butterflies, and reading, as well as showing them in quiet reflection. 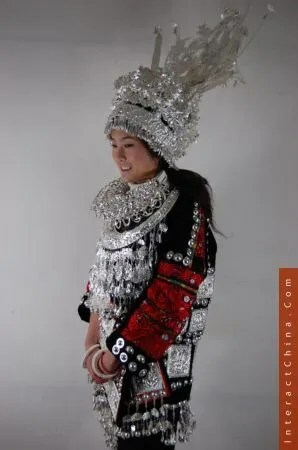 He also showcased the most popular costumes and hairstyles of the Qing court women. 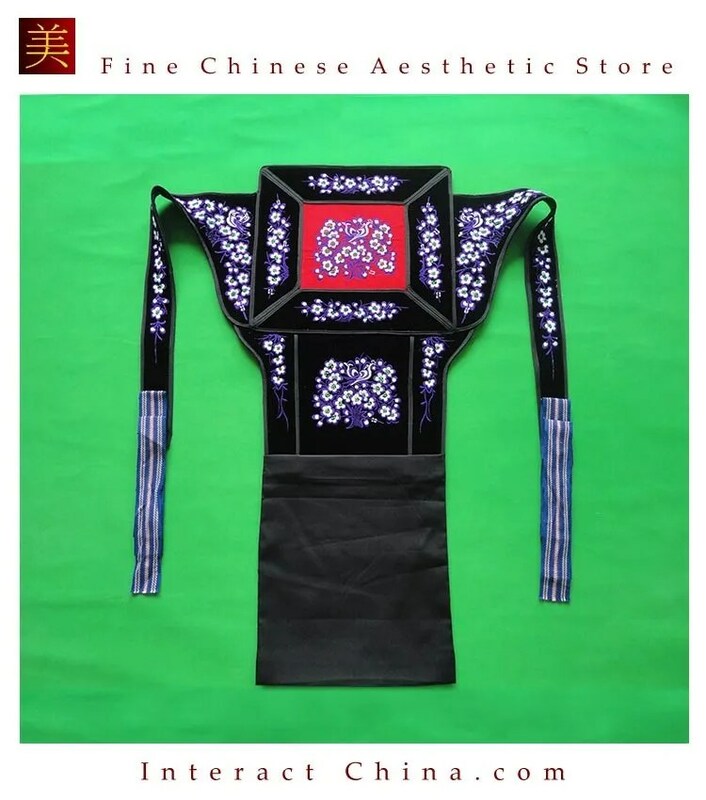 For research on costume and accessories of Qing dynasty court women, these paintings are visual and historical documents of unparalleled authenticity. 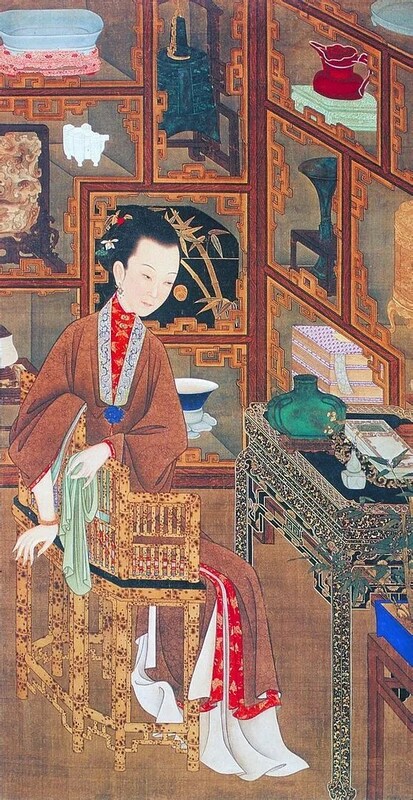 They reveal perceptions about the women of the court during the reigns of Kangxi and Yongzheng, whilst also documenting their refined demeanor and fine costumes. 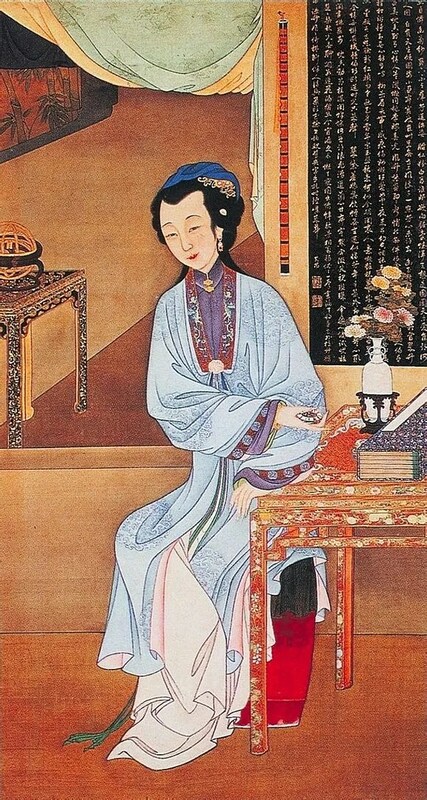 Holding a book with a page half revealed, the woman in this painting seems to be reciting to herself. On the wall behind her is a small colored landscape painting. The decorative leaf below the painting is inscribed in cursive script with a poem by the distinguished Northern Song calligrapher, poet, and connoisseur Mi Fu (1051-1107). This courtyard is full of flowers, grasses, bamboo, decorative rocks, and an array of miniature landscapes in containers (pen jing) that include orchids and Chinese rose. The lady leaning on the gate wistfully gazes, perhaps with romantic yearnings, at the spring colors filling the garden. The lady stands leaning on a table. Beyond the railing, bright butterflies hover by decorative garden rocks and day lilies. Although the painting describes a woman doing little more than indulging in summer leisure, because of the allegorical nature of the day lily and its implication of giving birth to a son, this scene can be understood as having the auspicious message that the woman depicted is pregnant with a boy. She holds a small calabash. Since the calabash gourd belongs to a group of plants that communicates flourishing growth, it is often used to suggest the idea of many sons. 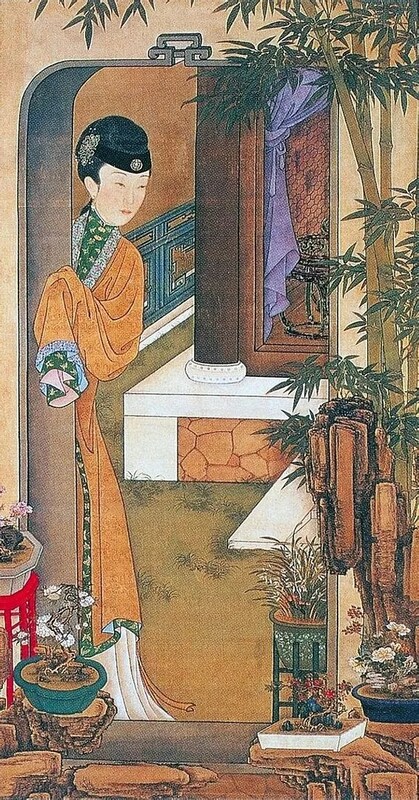 With the day lilies in bloom beside the railing and the calabash in her hand, the painting is not only visually attractive, but also manages to have deeper meanings. By candlelight, this lady is occupied with her needlework. 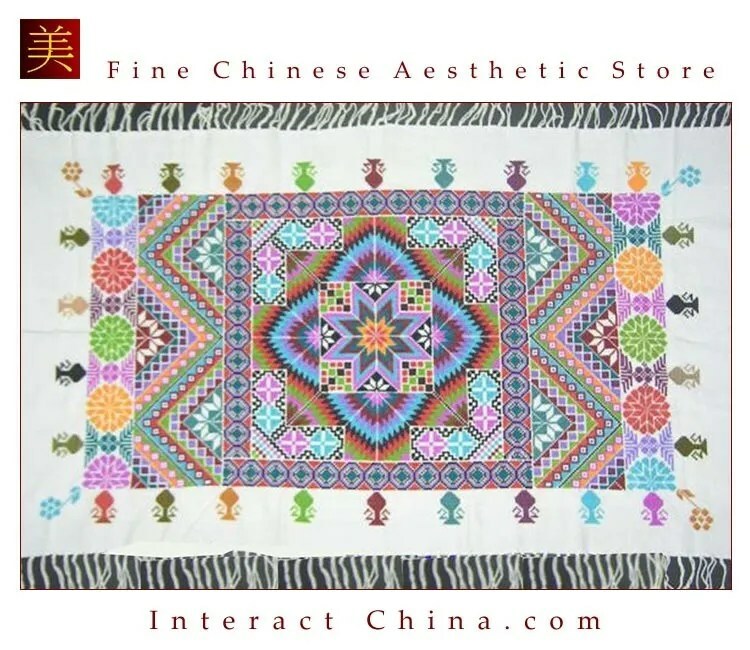 Typically needlework encompassed weaving, embroidering, and sewing. 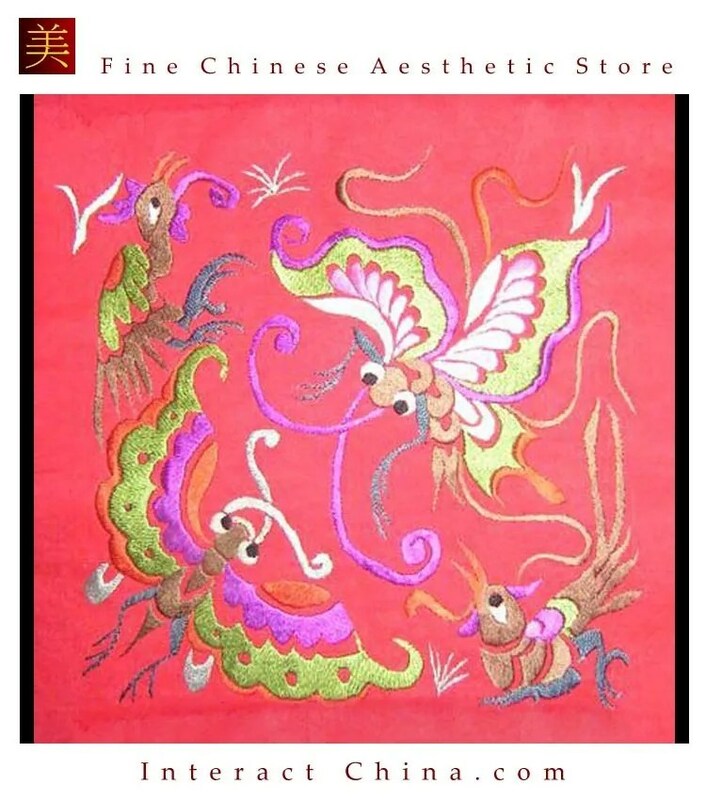 In the past, needlework was one of the most important standards to judge the character of a woman. 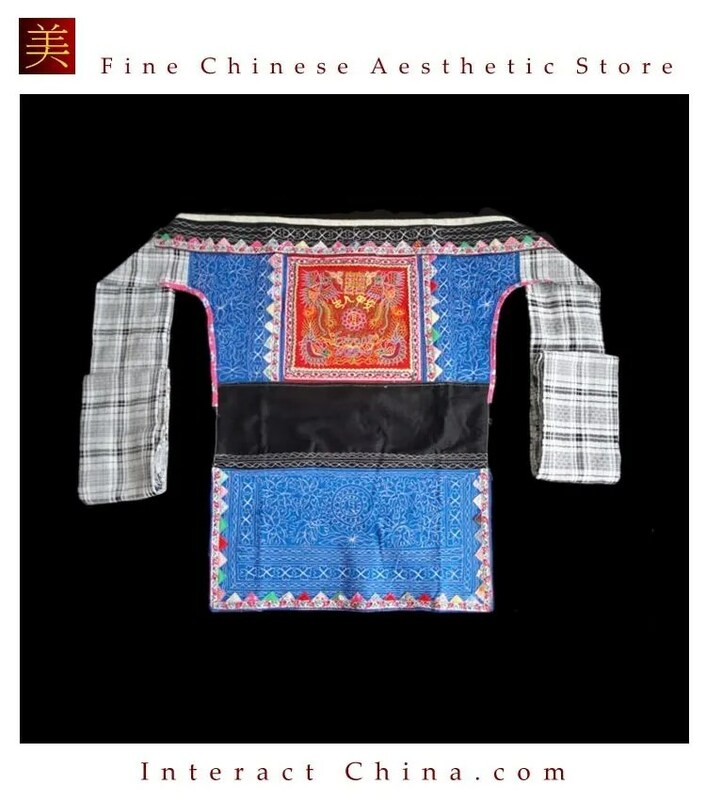 Any woman who was good at needlework would be highly regarded. The lady in this picture picks the needle elegantly and seems lost in thought as she works. 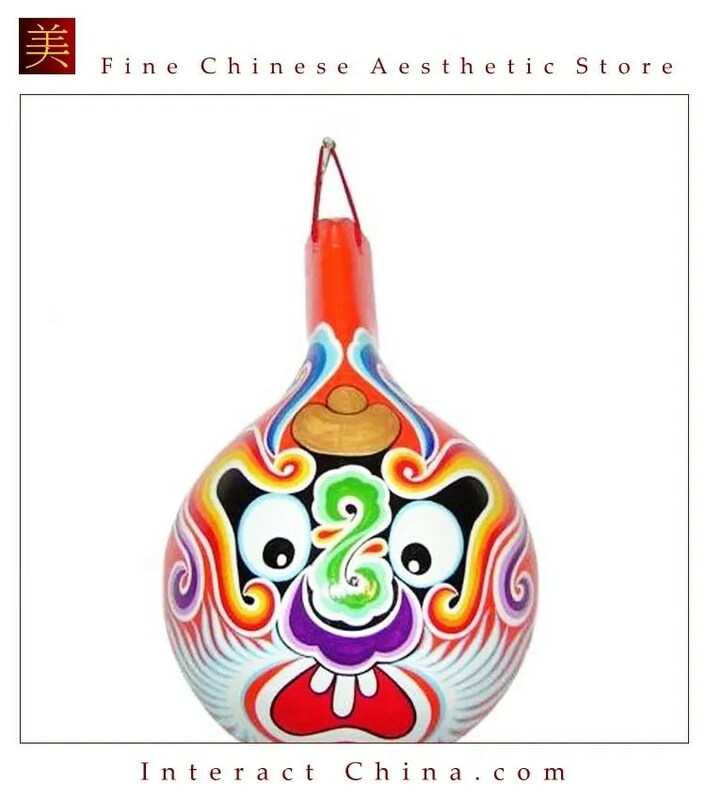 The red bat flying through the bamboo in the background is a symbol of good luck. 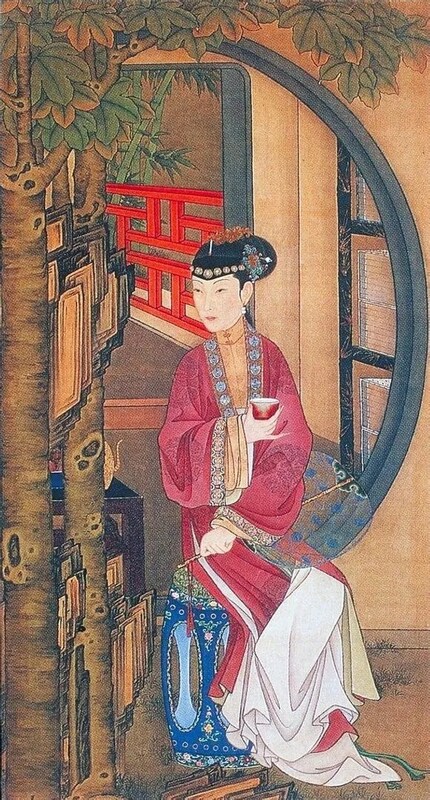 With a large gauze fan in her hand, this lady is sampling tea beneath the branches of a parasol tree (wu tong shu). Originally drinking tea was a simple daily ritual. It became associated with the intellectual world when gentlemen combined sipping tea with the discussion of world affairs and ideas, thereby elevating its status. Inside the moon gate, the black-lacquer bookshelf with gold décor is filled with books. 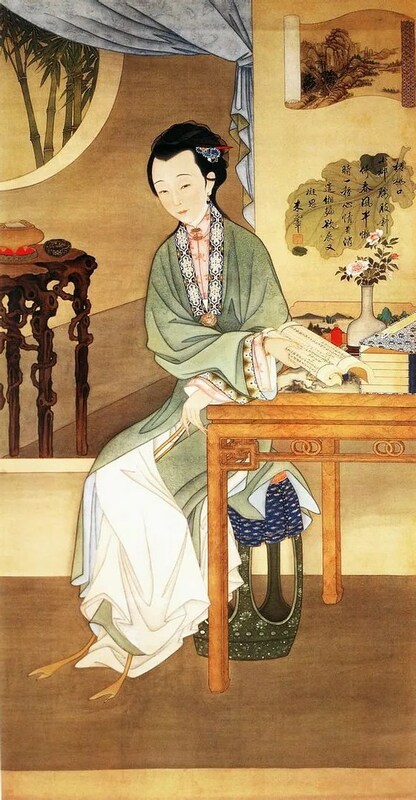 The fascicles not only add an atmosphere of Confucian learning, they also combine with the elegant porcelain cup in the woman’s hand to indicate that she is culturally accomplished.